Link to my Canadian Scientists page. Many vole and lemming populations in north temperate and arctic ecosystems fluctuate cyclically reaching peak populations every 3-4 years. Since 1959 I have been trying to find out what drives these cycles. I have been trying to unravel the web of social behaviour, predation, and food supply constraints that act on rodent population growth rates. The dominant theme that has emerged from our work on rodents is that aggressive behaviour, particularly of breeding females, is a major cause of juvenile losses in rodents and should be considered along with predation mortality and food controls on reproductive output. 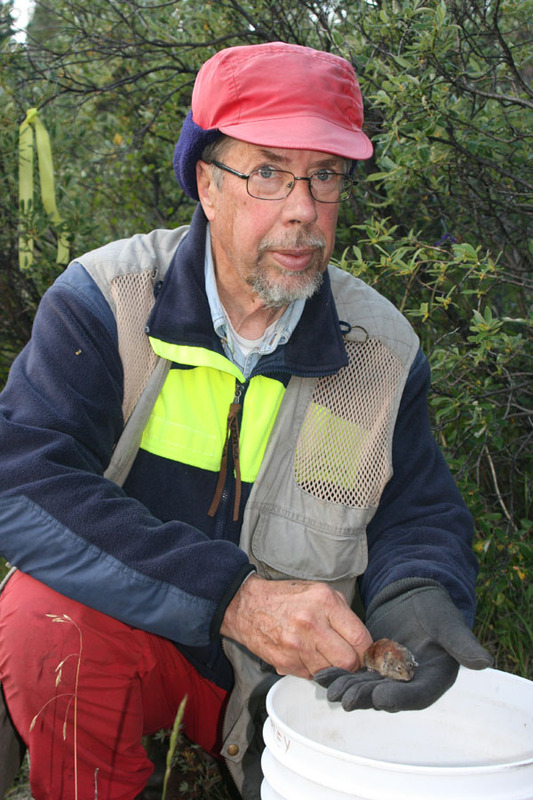 In 1973 I began studies on the ten-year cycle of snowshoe hares at Kluane Lake, Yukon, and I have continued to work there on population fluctuations of snowshoe hares, voles and mice with colleagues and graduate students. I retired from teaching at the Zoology Department of UBC in 2001. I continue to carry on research on population dynamics of snowshoe hares, mice and voles at Kluane Lake in the southwestern Yukon and we have now maintained a 46-year monitoring study on the small mammals, their predators, and food plants that form the basis of the Yukon boreal forest ecosystem. In 2012 we began testing the use of camera traps in the Yukon forests to estimate population changes of all the major terrestrial vertebrates. If successful, this could deliver quantitative data for state-of-the-environment reports on terrestrial ecosystem changes. This work is directed by Alice Kenney with the support of the Dän Keyi Renewable Resources Council and the Kluane First Nation.